Searching for a person lost in the bush involves gathering information and then acquiring and applying appropriate resources to specific areas. 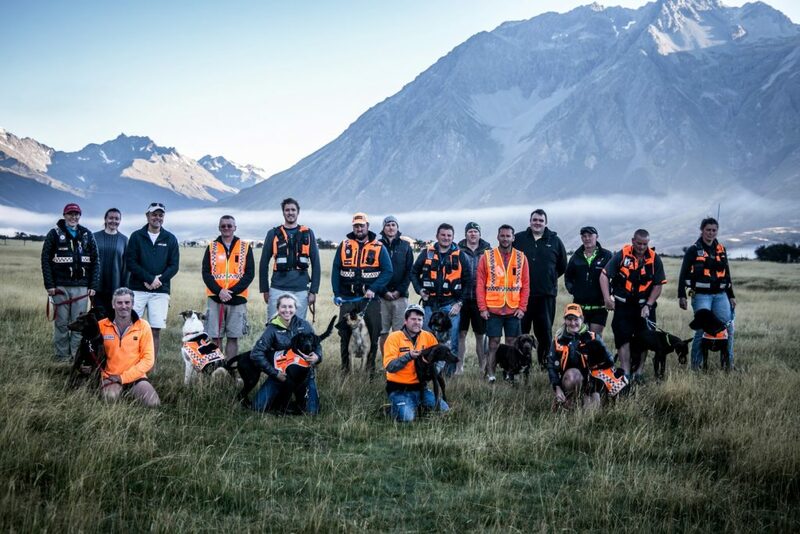 NZ qualified SAR search dogs with experienced handlers can be a valuable supplement to other search resources. Effective deployment requires an understanding of how a search dog works – their strengths and limitations. 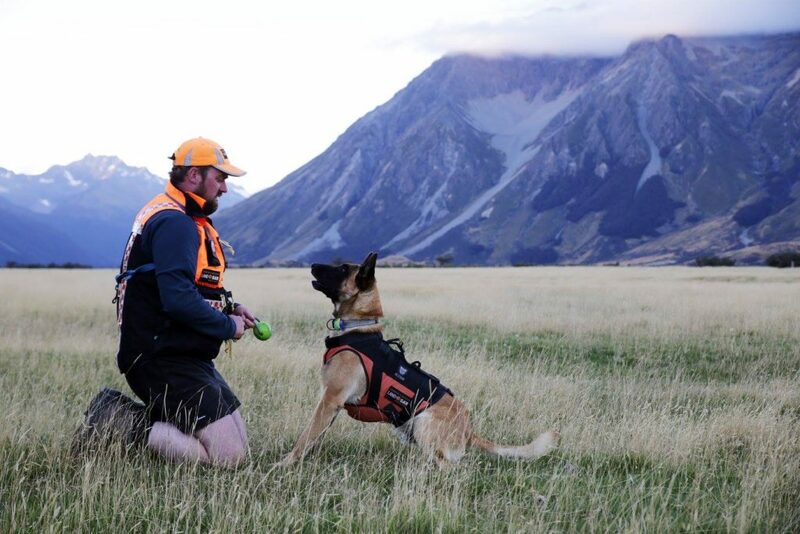 Wilderness search dogs are trained in two areas, tracking and/or area search (air scenting). These dogs are trained to follow ground scent where a person or persons has walked. The ground scent is made up of some personal scent from the person as well as scent created by the crushing of soil, vegetation and organisms on the ground. It is important that the tracking dog is called early as time is the biggest enemy of ground scent. It is also important that the area is not contaminated by other searches as the dog will follow the most recently laid line of scent. Tracking dogs can be a very useful tool in the hands of an experienced handler. They can track much better and quicker than a person using visual sign and can be used to sign cut tracks, ridges, creek beds etc. The limitations of tracking dogs are determined by time delay, weather conditions and the surface they are asked to track on. When conditions get tough the handler will call on his, or his team mates visual tracking skills to supplement the dog’s ability. The dog’s air scenting ability will always be there, no matter the conditions and the Handler will be aware of this. All humans emit microscopic particles bearing human scent. By the millions, these particles become airborne and can be carried by the wind for considerable distances. Airborne scent is concentrated near its source and follows the air currents, and becomes more dilute the further it travels. The handler will determine how the area is to be searched, no matter which direction the wind is blowing. 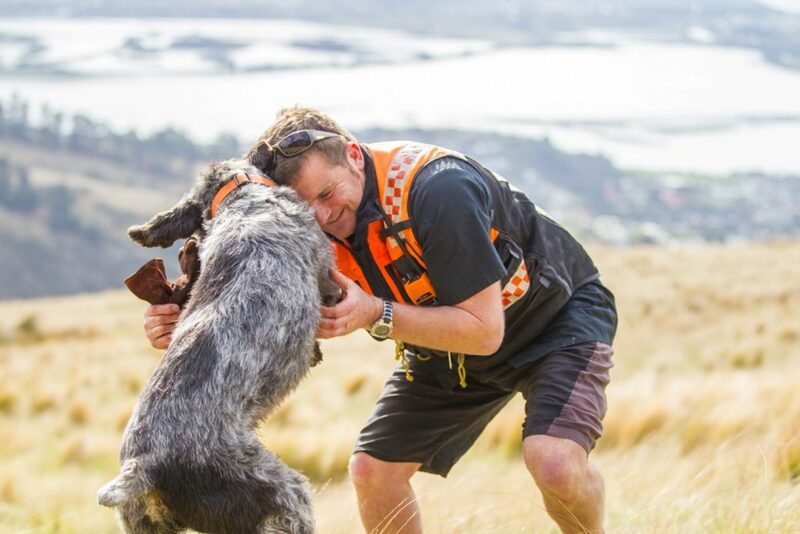 A NZ qualified air scent search dog will ‘follow up’ the scent to the lost person, through heavy bush, along beaches, lake shores, over farmland and parks, during the day, evening and in the dark. These dogs can search long after the track is obliterated and contaminated, zeroing in on where the person is now, regardless of how they got there. Ideally the callout should occur the moment it is suspected a person is missing, especially if they are lost in bush/wilderness/farmland/park/beach. Most search dog teams welcome early deployment, even if the search is resolved before they arrive. If in doubt, discuss the situation with the dog handler direct. SAR dog teams are adept at working at night/evening/early morning and can be deployed while other resources are being marshaled. They are routinely deployed at night. Probability of Detection (POD) for a dog is higher in the evening and into the night because scent concentration is highest and the lost party (or LP) is likely to remain stationary once darkness falls. Dogs see quite well in the dark, increasing the chance of detection. They are useful in almost any weather that a handler can cope with safely. 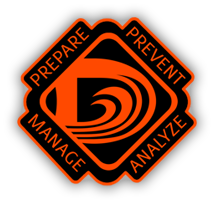 lthough strong winds, snow or heavy rain may destroy all traces or a subject’s track, the subject is still emitting scent, even if deceased. Wind helps rather than hinders the dog’s ability to detect scent. Light rain will rehydrate scent emitting particles that may have dried up during the day. The air scent dog will not discriminate who they find. Its preferable that air scent dog teams are assigned to areas thought to be empty except for the LP. While it helps if others have not been in a search area before the dog is sent in, an air scent dog team can be sent in soon after to re-check an area and it is recommended this happen if the area is considered to be an area of high probability. Area search dogs come into their own when dealing with non responsive people, such as very young children who typically won’t call back to a stranger’s voice, dementia sufferers, autistic children, unconscious or deceased people. Non responsive people can be very difficult to find by visual means alone. A dog doesn’t need to see them and relies on air borne scent. Each handler requires 1 to 2 other team members who are experienced SAR members, good navigators and can cope easily with communications. It’s ideal they have trained with the dog team so they understand how the dog team works to be most effective. Dog teams will need to take breaks as people teams do and are capable of working multi-day searches. All SAR dog teams will carry dog 1st aid, dog food, dog helicopter lifting harness, map, compass and GPS. Search Managers cannot be expected to be experts in the deployment of search dogs and must get to know their dog teams. Know what they are capable of and not be afraid to ask them how the team can be best deployed. either local or by the 111 system.